Kick off the summer with a free community event! Samaritan and St. Mary’s hospitals will present the movie “Ferdinand” at the third annual Park and Play Movie Night. The event will take place on Friday, June 8, on the lawn of St. Mary’s Hospital, located at 1300 Massachusetts Avenue in Troy. The fun starts at 7:30 p.m., with kid-friendly games, free popcorn and refreshments. Families are welcome to bring their own blankets and lawn chairs. The movie will start at 8:30 p.m., on a giant outdoor movie screen. 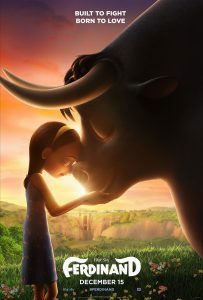 Academy Award nominee, “Ferdinand,” tells the story of Ferdinand (voiced by John Cena), a giant bull with a big heart. After being mistaken for a dangerous beast and torn from his home, he rallies a misfit team of friends for the ultimate adventure to return to his family. The event is free of charge and open to the public. Children must be accompanied by an adult. Alcoholic beverages, smoking, and pets are not allowed. Blankets and lawn chairs are welcome. Space is limited and available on a first come basis. Free parking is available in the St. Mary’s parking garage and lot. For more information, please contact Elaine Serafini at 518-271-3372. This event is part of the St. Peter’s Health Partners’ “Healthy Future, Healthy Troy” campaign, a part of the health system’s Troy Master Facilities Plan – a strategic, multi-phase plan to revitalize the infrastructure of Samartian and St. Mary’s hospitals and transform health care in Troy, Rensselaer County, and the surrounding communities.